Let students observe with a close eye, then compare views! Three visual experiences: 4x magnification, 8x/20x combo magnification, and kaleidoscopic distortion. 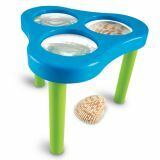 Great early science tool for observations and investigations of leaves, rocks, insects, feathers and more. 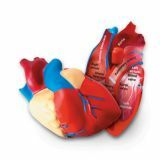 Students manipulate the inner workings of the human body as they build the models, gaining a deeper understanding of how organs and systems interact. 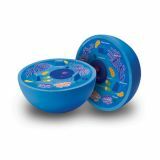 Perfect for human body centers focusing on major organs or the circulatory, nervous or skeletal systems. Each realistically detailed plastic model includes a display stand and guide with facts and step by step, photo-illustrated assembly instructions. 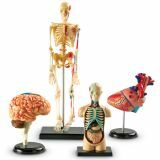 Grades 3+ Includes heart, brain, human body and skeleton. The wings on this engaging ladybug jar open to reveal a 3.5x magnifying lens for close-up observation. 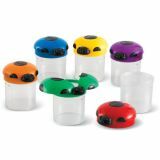 Keeps living critters and other matter secure with a screw-on cap and air vents. Students can look inside their own heads with this realistic model. 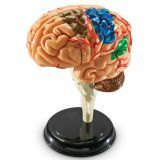 Features cerebellum, frontal, parietal, temporal and occipital lobes, corpus callosum, brain stem, hippocampus, ventricles, insula, corpus striatum, internal capsule and lentiform nucleus. Includes 31-piece model, display stand and guide with facts and photo-illustrated assembly instructions. Measures 3.8"H when assembled. 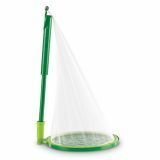 Telescoping handle folds up, transforming the net into a tent. Easy-on "lid" keeps butterfly in place and makes release a snap. Net measures 10.25" in diameter. Handle measures 9" - 17". Crack open this set of 21 eggs and see the day-by-day development of a chick. No incubator required! 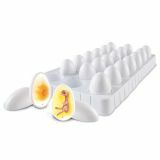 Features realistic illustrations of a developing chick; plastic 3D chick inside the final egg. Durable plastic eggs measure 2.75"L each. Fun for the whole family! Kids can learn fun and interesting facts about animals in various habitats. 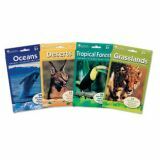 Oversized cards are easy to handle and feature 24 animals in full-color on one side, and class, habitat, location, size, diet, body covering and fun facts on the other side. Activity Card included. Take a look inside this head for better understanding! 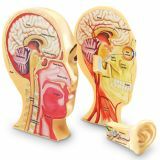 Study the anatomy of the human body and the senses with this 3-section model of the human head. 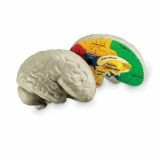 Provides realistically rendered cross-sections of the head, including the brain, eye and ear canal. Durable foam head wipes clean and measures 7.75"H.
A helpful, hands-on tool for human body lessons. Realistically detailed soft foam ear model features 2 different labeled pieces. 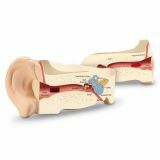 Activity Guide features ear anatomy facts and a reproducible diagram to use as a worksheet or quiz. Highights anvil, cochlea, ear drum, Eustachian tube, hammer, outer ear canal, semicircular canals, nerves and stirrup.